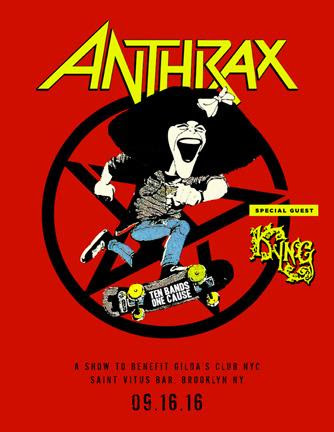 With October designated as Breast Cancer Awareness Month, New York born-and-bred thrash/metal icons ANTHRAX have announced a very special concert to be held at Brooklyn's Saint Vitus Bar on Friday, September 16. "This has to be the most intimate show we've played since the early 80s which makes it so special," said vocalist Joey Belladonna about the Saint Vitus Bar, known for putting on massive underplays in their small Brooklyn bar. Jose Mangin from SiriusXM and Affliction will be on hand to host. Tickets are priced at $50 and go on sale at noon this Friday, August 19 at this location. All proceeds will go to benefit Gilda's Club NYC, and everyone who purchases a show ticket will get a special, limited-edition t-shirt created just for cancer awareness, courtesy of Jakprints. In addition, ANTHRAX has joined up with artists including THE BLACK KEYS, the PIXIES, Ed Sheeran and the RED HOT CHILI PEPPERS to take part in this year's Ten Bands One Cause promotion aimed at bringing awareness to October's Cancer Awareness Month that also benefits Gilda's Club NYC. A limited number of ANTHRAX's new album, "For All Kings" (Megaforce) will be pressed onto pink vinyl and released on September 27. Identified by a special sticker, the album will be available at all retail stores where vinyl is sold, through Amazon and all F.Y.E. stores. 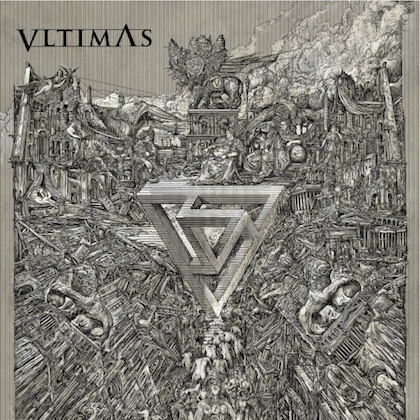 Fans will be able to get their hands on a copy of "For All Kings" pink vinyl before release date as a small quantity — all signed by the band — will be on sale at the Saint Vitus show. The band members will tell you that Tina never missed an ANTHRAX show. When the band played New York, she was there. She loved baking cookies and she knew each band members' personal favorites. When they played Yankee Stadium with the "Big Four," she baked everyone's favorites and brought them to the band's dressing room. The day his mom passed, Charlie wrote: "My mom was all about letting me follow my dream, she always pushed me in that direction. She was the one who would take me to buy my records, she was the one who would sit through a matinee of all five 'Planet Of The Apes' movies. She was the one who got me to be who I am. I am going to celebrate her life every day." Said ANTHRAX's Scott Ian about Gilda's Club NYC: "No one should face cancer alone. The vital support they give to cancer patients and their families is truly a noble cause and we are honored to be able to help."